Happy new year everyone! I love reading through what people loved over 2014, so I decided to share what my favourite skincare products were over the past year! These things have all helped my skin a lot, and I would recommend them all. Lets get started! Garnier Micellar Cleansing Water – I’m sure everybody on the face of the earth has heard about this product. This stuff has saved my poor skin and rescued me from make up wipes! Its what I’ve used through out most the year and I’m going to be continuing to use this throughout 2015! T-Zone Pore Strips – I used these strips up quite a while ago now and forgot to re purchase them, but when they are just the best thing. I’m sure everybody has heard of pore strips, but I haven’t seen many people talk about them. They take out all the bad stuff stuck in your pores, you just place them across your nose and leave them on for about 10 minutes, then when you peel it off the horrible stuff in your pores should be gone! Loved these. Quick Fix Purifying Charcoal Face Mask – I have featured this on my blog previously but this face mask is my favourite. Its basically a dupe of the sanctuary spa charcoal face mask. The main thing I love about this face mask is how soft and smooth your skin feels after taking it off. It really gets rid of all the gross bits of skin hanging around on your face. Such a good one. Simple Kind to Eyes Revitalising Eye Roll On – I can’t rave enough about this little gem. This is the first tube I’ve had and I’m still using it, I think I’ve had if since about June? Anyway, this has really helped my under eye dark circles and also to depuff them. Its so cheap as well, I’d recommend this to anybody who suffers with dark circles. 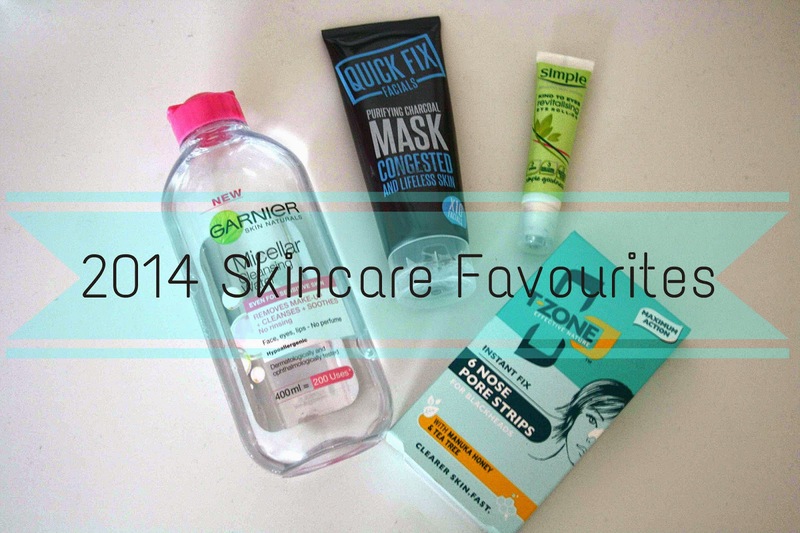 Whats been your favourite skincare products of 2014?